If you are annoyed that the new candidate bar in iOS 5 makes some text input fields/bars not appear. Then you will be glad to know that the InlineCandidate for iOS 5 Cydia Tweak forces the keyboard candidate to be in inline mode (same as iOS 4), so the text input fields and bars can show. 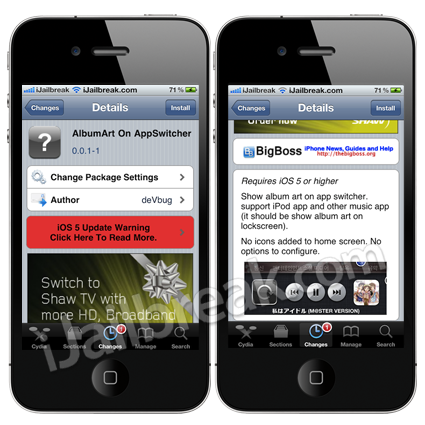 You can find InlineCandidate for iOS 5 through the BigBoss repo for free. With the AlbumArt On AppSwitcher Cydia Tweak you can display album artwork in the App Switcher that is activated by pressing the home button twice. Additionally, this Cydia tweak should display album art on the lock screen. The tweak is great for all of those who are visually orientated, and would like a small way to stand out from the crowd without heavy modifications to their iPhone, iPad, iPod Touch. If you are interested in AlbumArt On AppSwitcher you can find it through the BigBoss repo for free. Does it bug you that when you take a screenshot of your iOS Device’s screen that the photo is uploaded to your Photo Stream? Well if it does you will be glad to know that with the Screenshot Dam Cydia tweak you can stop this from happening for good. Upon installing the Screenshot Dam tweak any screenshots that you take on your iPhone, iPod Touch or iPad will not be sent to your Photo Stream. 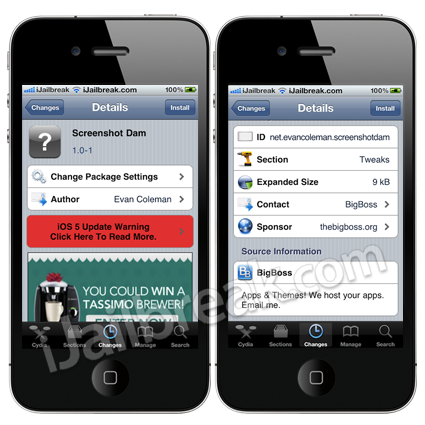 You can find Screenshot Dam through the BigBoss repo for free. If you are annoyed by the fact that your wallpaper does not always show, for example, when you plugin your iOS device in to charge. The WAlpha Cydia tweak allows you to set the wallpaper’s alpha to maximum always and everywhere throughout your iOS device. This means your wallpaper should never be faded or disappear during certain system functions like it does by default. You can find WAlpha through the ModMyi repo for free. What’s your thoughts on these jailbreak tweaks? Let us know in the comments.